On this day in 1945, Wesley Mouzon and Dorsey Lay fought a classic battle at Philadelphia's Convention Hall before a crowd of 7,419 fans. North Philly's lean and mean Mouzon dished out a ton of punishment over the course of the fight but Dorsey Lay kept coming at him. Every time Mouzon would lash out with his effective combinations Lay would battle back with dangerous blows of his own. But Mouzon's fists were like magic wands. Repeatedly his swings would produce serious damage upon his West Philly foe. Early on, Lay was cut above both eyes and shortly thereafter suffered a broken nose. But no matter what pains he was presented with, Dorsey would not back down. Lay bulled Mouzon to the ropes and piled on the pressure. He was in the fight all the way. Even as late as round seven, with blood streaming down his face, Lay won the action to take the round. But overall it was Mouzon who proved himself the better boxer and seemed to master the struggle. In round eight, Mouzon ran with his advantages and had Lay bloody and nearly out on his feet. Lay was determined but could do no more. 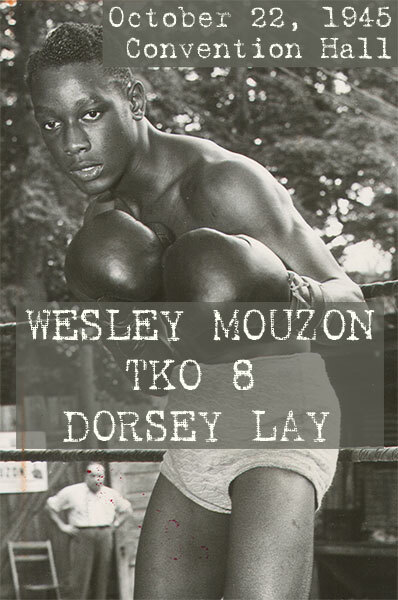 The fight was stopped after the conclusion of the eighth round and Wesley Mouzon went to 16-1 with his 7th KO.